I Need a Small, Fun Car That Will Last at Least Ten Years! What Should I Buy? Ken from New England likes small, fun, and zippy cars. He keeps them a long time, but his current ride is getting towards the end of its life. Ken’s ready for a new ride but wants something that can last a while. What car should he buy? It’s time for me to buy a new car. I mean, my current car is mostly great, but I’ve had it 10+ years and if I don’t buy a new one now, I have to keep it another 10 years so that I don’t interrupt our cycle of “only one car payment at a time.” I’m not really “done” with my car, but it has 170k miles and will need a clutch and AC soon, so I’m not keeping it for another 10 years. To be honest, I want everything I have now, and more. I don’t want to regret giving up a car I love to get a new one I don’t love. The “love” traits are: small, zippy, small, cheap to operate, small, good aftermarket support, and it must be small. Oh yeah, and it must be an automatic. My clutch foot has maybe half a million miles on it and is showing signs of wear. This would be mostly a commuter car, so I don’t really need more than two seats a coupe would be fine. I’ve always liked the Nissan Z but I think the insurance would be too high. I love Mini Coopers as well but I’m worried about the long-term running costs. As for budget, I can spend up to $35,000. Wants: Small, fun, reliable and SMALL! Doesn’t want: A manual or a large car. Image: Andrew Collins/Jalopnik....look at him go! Ken, while I have a pretty good feel for what you want, you didn’t tell us what your current car is! That’s a helpful piece of information for all you folks that plan on submitting an entry to this column. So the key attributes you are looking for are reliable, zippy and small. The challenge is the fact that there aren’t many truly “small” cars anymore. Even something like a Volkswagen Golf that was is still considered “compact” has about the same space as a midsize sedan from not too long ago. And the handful of really small cars on the market may not have the longevity you are looking for. What you need is a Honda Fit. It’s one of the best small cars on the market and while the previous generation cars could feel a little dicey at highway speeds, the current model is much improved and more stable. The Fit isn’t a hot hatchback but it handles very well, is comfortable, and not too shabby in the power department with 130 ponies under the hood. Ideally, you would get this car with Honda’s fantastic six-speed manual, but the CVT isn’t bad if that is what you really want to do. Now given the fact that a decently equipped Fit will run you about $22,000 that’s a ton of budget leftover. Which means you could theoretically buy a 1.5 liter, 174 HP, turbo motor that would go into a Honda Civic and find some mad scientist to cram it into your Fit. Get the project done right and you have your zippy runabout and maintain the Honda build quality. Ken, this is a fantastic plan. 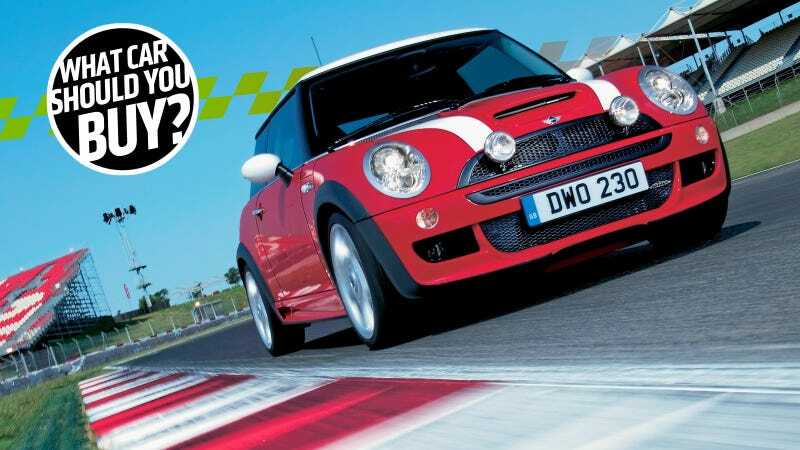 I can’t think of any better adjectives to guide car buying than small, zippy and fun. There’s a lot of good options out there, even factoring in the automatic, reliable, and good aftermarket support caveats, so I think there’s no reason not to really crank that fun dial. That’s why I think you should get a Toyota Sera. The Sera was from that wonderful early ‘90s period of glorious madness in the Japanese car industry, where they would seemingly okay every crazy new idea with a swig of sake and shouting “sure, why not?” or whatever the Japanese equivalent is. One of the products of this era was a charming little sporty car with huge bubble-glass windows and gullwing freaking doors: this car, the one I’m talking about, the Sera. Mechanically, the Sera was bulletproof Toyota, the same drivetrain as you’d find in Corollas or Paseos of the era. That means there’s plenty of aftermarket parts for the car, and you can get it serviced and repaired right here in the United Snacks of America. It’ll last another decade, no problem. But unlike a Corolla, this thing is dripping with character and fun, like a corn dog dipped into melted fun-cheese and character-chili. It still looks futuristic today, and every time you park and swing open those spaceship-like doors it’ll be like you’re a celebrity, walking into the 7-11 to get some anti-fungal cream or a two-liter of Fresca. Look, here’s one for under ten grand! That’s like a third of your budget, so you can spend some money tricking it out the way you want! Do it, Ken! Go grab that little lump of fun! Expert 3: Raphael Orlove - You Said How Long? I was going to say that you should go ahead and get a Nissan Be-1 or a 1993 Toyota Mark II and put coilovers on it, but then I realized I was yelling at the mirror again! I’m sorry, Ken. If I were buying a fun auto car that needed to last a good amount of time, I would buy an old Sentra SE-R or NX2000 and run the hell out of it, but I’m also a dirtbag when it comes to cars. A nicer new one would be the Fiat 500 Abarth, a car that brings joy wherever it goes with an unmuffled exhaust. It is the smallest Ferrari you can buy. Some people (my boss) kinda blah’d about it with two-pedals, but he probably wasn’t left-foot braking around dirt roads as I imagine all auto Abarth owners are. All the time. Wait, you said last for how long? Ah. Hm. I&apos;m a Medieval Sword Fighter and I Need a Ride That Can Be My Armor! What Car Should I Buy? I Need a Family Car That is Cheap And Weird! What Car Should I Buy? I Need A Car I Can Drive One-Handed And Take Skiing! What Car Should I Buy?